This free Bible lesson is based on Mark 11:1-11 when Jesus rides into Jerusalem on a donkey. It is designed for children’s church or Sunday School. Please modify as best fits your ministry. If your church follows the Revised Common Lectionary, this teaching plan would correspond to Year B – 6th Sunday in Lent, Gospel Reading – Mark 11:1-11. Opening Activity – Roll Out the Red Carpet – Smile for the Camera! Give the kids a few minutes to get ready for their red carpet moment. Then lay out the red rug/sheet and let each child walk the carpet and get their picture taken. Encourage everyone to cheer on each child while it’s their turn. Who liked getting their picture taken? What was the best part? You know I didn’t even get to walk and I still loved it! I loved seeing how happy it made everyone! Did it make you feel special? To have everyone looking at you, cheering for you, and even having your picture taken? It must feel special to have everyone’s attention on you. For that moment, you were the most important person in the room. Well, it might surprise you that there was a red carpet in the Bible that the people of Jerusalem set out just for Jesus. Really, it’s true! Ok, it was a little bit different. First of all, the carpet wasn’t red, it was green. Can you guess what it was made of? Palm branches! 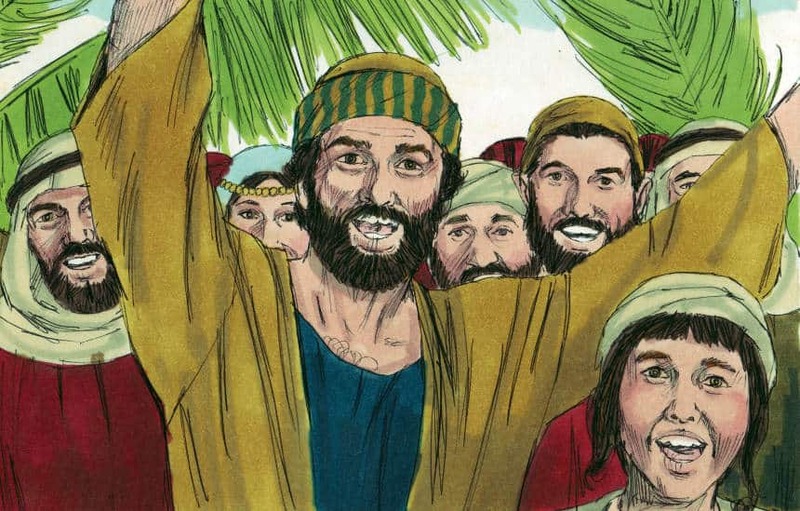 The people collected a whole bunch of palm branches and laid them out on the road leading into Jerusalem just for Jesus. When Jesus started down his red, oops green, carpet everyone was watching and cheering Him on. They even sang out to Him “Hosanna! Blessed is the one who comes in the name of the Lord.” They wanted Jesus to feel special, and they wanted all of the attention to be on Him. They wanted Jesus to know that He was the most important person in Jerusalem. Why do you think they wanted to do this for Jesus? What would you do if Jesus was coming here? Would it just be like any other day? Or would it be special? Would you do a red, or green, carpet? Or maybe a parade? Jesus is absolutely the most important person ever, and just like the people in Jerusalem, we want to make sure we show Him just how important and special He is. But you know, we don’t have to be able to physically see Jesus as a man to show Him how important He is to us. Just because we can’t see Jesus, it doesn’t mean He’s not here. Actually, Jesus is here right now. RIGHT NOW! Jesus is always with you! And if Jesus is always with you, what should we always be doing? We need to show Him how special and important He really is. Now, that doesn’t mean we need to drag a red carpet with us everywhere, but there is one HUGE thing the people of Jerusalem did that we can do too. They took time out of their day so they could spend it with Jesus. Is that something we can do? Of course we can! It doesn’t have to be huge or fancy like the green carpet into the city. That’s not what’s important to Jesus. We just need to show Jesus how important He really is. He just wants to spend that time with you. It’s that easy. So let’s try it! Just one time this week, let’s turn off the TV and read a Bible story instead. All together we can show Jesus just how important He really is to us. Pass out Bibles to students. Bibles should be closed and sitting on the table face up in front of each child. When you say go, have the kids look up this week’s Bible verse. As each child finds the verse, have them stick one finger on the verse and quietly raise their other hand. The first one to find the verse gets to read it to the rest of the class. Help younger kids and new kids find the verse by following these steps. Look in the Table of Contents for the book you are looking for. Make an effort to show them if it is found in the Old Testament or New Testament to help them in the future. Then open the Bible to the page number listed in the Table of Contents. Show them the large numbers in the text, known as the chapters. Flip through pages until you find the large chapter number you are looking for. Then scan through the text with them pointing out the smaller verse numbers until the correct number is found. Before class cut green paper into leafs, and write instructions on the bottom. To play the game, place leaves sporadically across a large room. Line the kids up on one end of the room, and instruct them to move from leaf to leaf to reach the opposite side. With each new leaf they land on have them turn it over and follow the instructions. Instead of a typical closing prayer, have the kids sing to Jesus together, as a way of showing Him just how important He is in our lives.